Good virtual reality is coming, but it isn’t here yet. That’s worrying. What if someone buys a cheap smartphone adapter, has a bad experience, and writes off VR as a fad? But Google, the company providing the cheapest solution of all—Cardboard—may have an answer. An answer that involves not strapping them to your head. From this week, Google will begin certifying some of these cheap, low-quality VR smartphone adapters under a new “Works With Google Cardboard” initiative. So if you buy a headset with the official “Works With Google Cardboard” sticker, the idea goes, you know you’re getting a good experience. Why? Two reasons. First, Google is going to slap a really clever QR code on each of these headsets that, once scanned with your Google Cardboard app, automatically tells your phone how the headset’s optics work, and automatically adjust games and apps to match. Any app built with the Cardboard SDK should work. Second, because what Google’s asking in exchange for certification, is that these headsets DO NOT come with complex controllers and DO NOT have a strap to keep them attached to your head. Uh... wouldn’t you want a strap? And wouldn’t a controller be nice too? Not necessarily, explains Google Cardboard product manager Andrew Nartker. Early on, the Cardboard team discovered that the existing crop of inertial sensors you find inside smartphones weren’t quite good enough to allow people to quickly turn their heads in virtual reality. (Incidentally, that’s why the Samsung Gear VR has its own separate tracker module.) 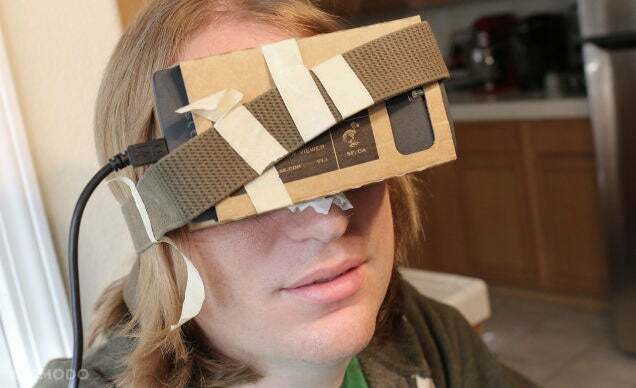 The team found that if you removed the strap, people would naturally hold Cardboard up to their face and turn their whole body instead of just their neck, which was easier for the sensors to process, and much less likely to make people feel disoriented. That’s why none of Google Cardboard’s hardware partners have straps. And if you’re holding up a headset to your face, you won’t have extra hands for a controller anyhow. Nartker says that right now, Cardboard is meant for “bite-size VR experiences”. Will that change? He wouldn’t say, and he definitely wouldn’t comment on rumours that the Cardboard team is secretly building a version of Android for virtual reality. I push harder. “Is it bite-size because it needs to be, or is it bite-size because that’s what people want?” I ask. “Everybody’s first experience in VR should be easy, something accessible, something easily understood,” he says. Fair enough. Don’t want to push too far, too fast. But there are definite signs that Google wants to take it further. The company yesterday also announced that it’s acquired Tilt Brush, the great holodeck-like 3D painting app we tried with Valve’s excellent VR controllers back at GDC. How does that make any sense if you can’t use your hands to control a virtual brush? Despite the Google acquisition, we understand Tilt Brush might still come to other platforms. And Google’s also acquiring a small team from Trinity College Dublin which specialises in positional audio — another important component of more advanced virtual reality. Google’s expanding the Cardboard section of the Google Play app store to include new categories, too, seemingly in preparation for a flood of new apps. “When the components are there, when the ecosystem is ready, when the content and users start to think of it that way… it’s exciting to think where we could take it,” says Nartker.